A thirty minute hike from Ashiyagawa Station (Hankyu), tucked away on Mount Rokko in Ashiya is the unique Takinochaya restaurant. Ashiya is in Hyogo Prefecture in Honshu. My wife and I were walking to the nearby Kōza Falls when we stumbled onto this charming hideaway. 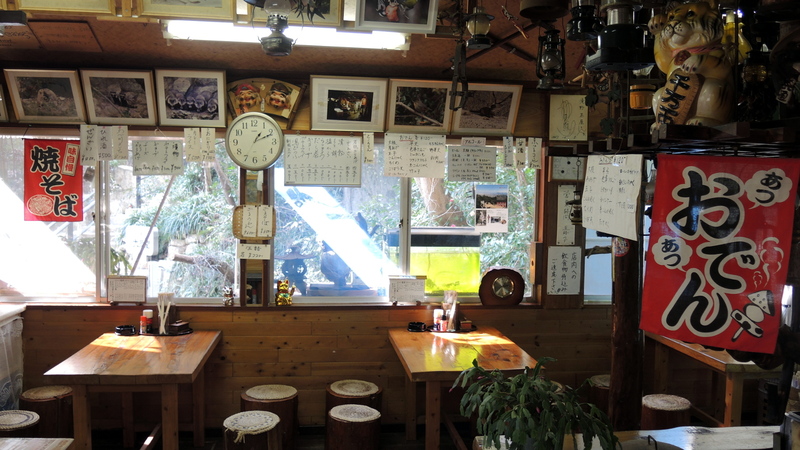 The log-cabin style eatery, specialising in oden and soba, was a welcome sight as we made our way up the mountain on a cold winter’s day. It staddles the rock face, arching over the path, with the main building overlooking the river flowing from Kōza Falls all the way down to Osaka Bay. 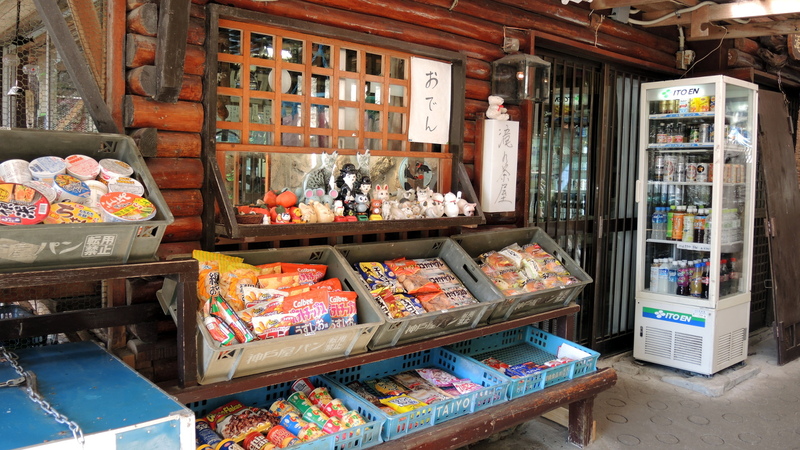 Outside there is a small honesty shop display selling pot noodles, snacks and souvenirs. A refrigerated cabinet hosts a selection of beers, soft drinks and teas, and there’s a freezer supplying ice creams, and mochi no doubt, in summer. 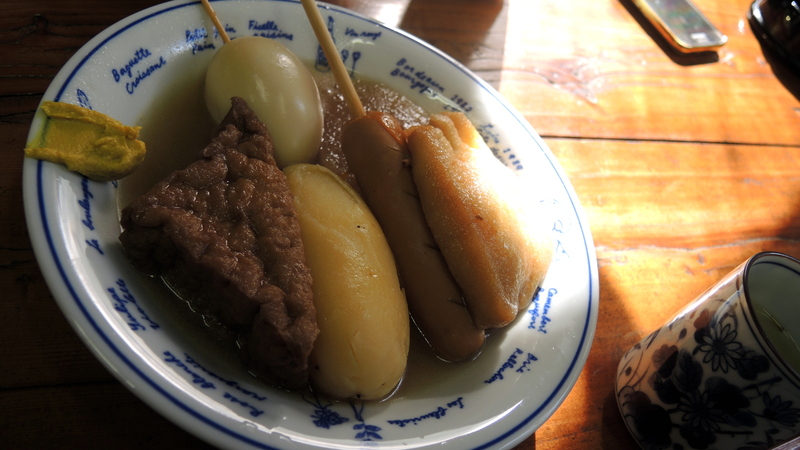 It being a chilly morning we decided to stop for some oden – a popular winter dish perfect for warming the body on a day like today. First impressions were that it looks like something out of a horror film. You know the kind. The ones set in remote rural locations, where the locals like to kill and eat those foolish to stray into their neighbourhood! Thankfully, it only looks like one of those horror movie locations. 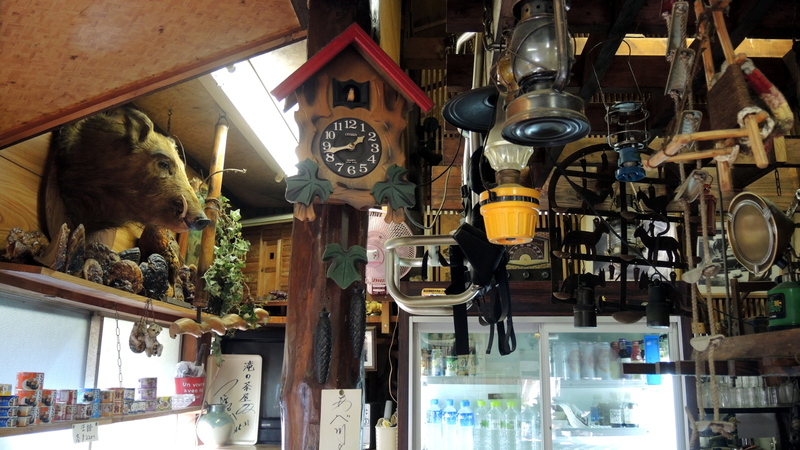 In reality, the restaurant is run by a friendly elderly couple who, I hasten to add, seem entirely harmless. It’s actually more like being inside a trapper’s mountain cabin. A raised fire pit in the centre of the dining room is surrounded by seats made from large tree logs, with woven matting cushions. It is packed to the rafters with ephemera and memorabilia relating especially to the inoshishi (wild boar) that roam this mountain. This ephemera includes a stuffed inoshishi head on one of the walls. Huge, vicious-looking metal boar traps hang from the ceiling. 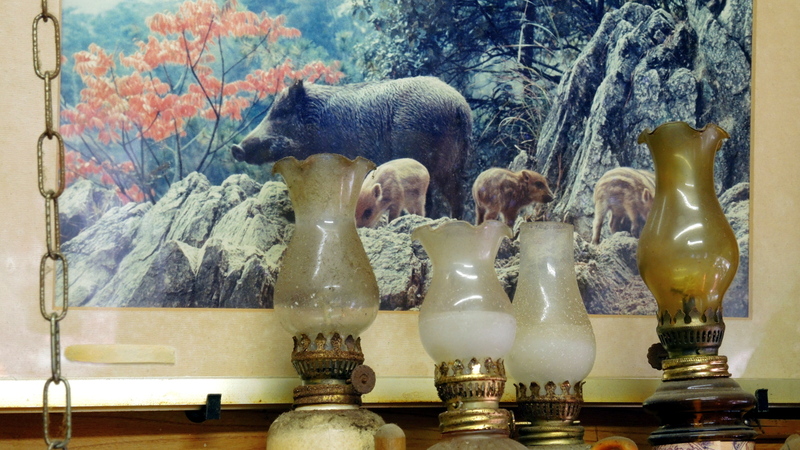 Among Japanese hunters, the boar’s courage and defiance is a source of admiration. It’s not uncommon for hunters and mountain people to name their sons after the animal. Adorning all the walls are photographs of the creatures, in various sizes, from cute baby piglets to rather more imposing adults. Photos that one of the owners confirmed were taken in this area. 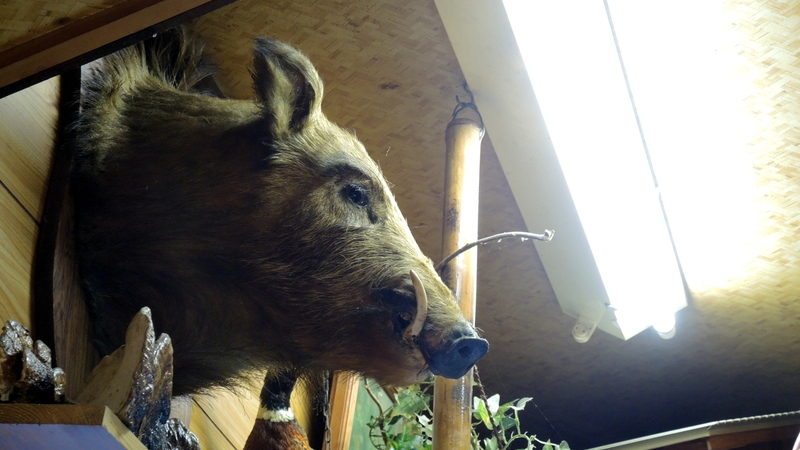 Although I have seen wild boar in Ashiya before, unfortunately we were not so lucky today. 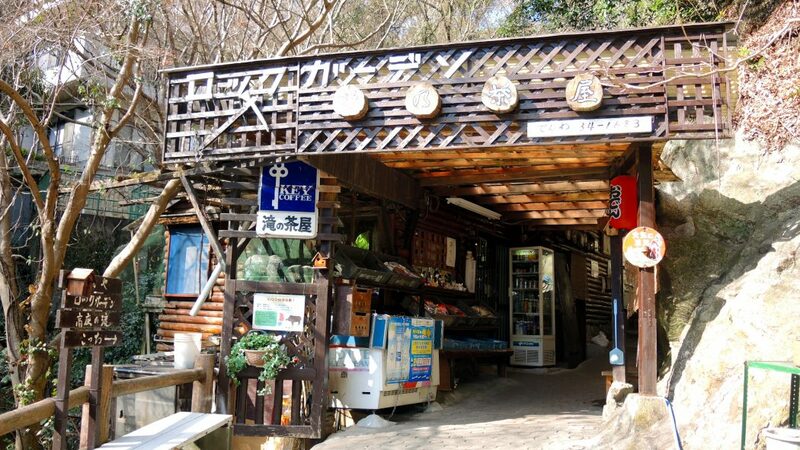 The restaurant is frequented by hikers enroute either up or down the mountain, as well as Ashiya residents. It’s the perfect pitstop – whatever the weather or time of year. The day of our visit was wonderful. Shafts of dazzling sunshine cutting through the shadows cast by the flora outside. 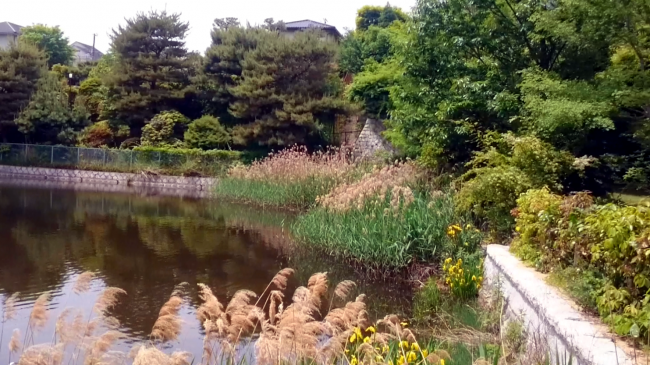 The greenery beginning to recover from the coldest days of the season. 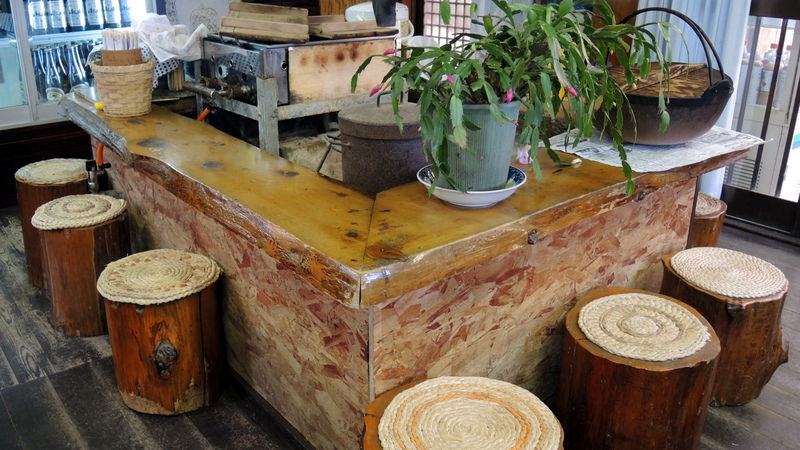 During winter the Takinochaya restaurant specialises in oden – a Japanese one-pot dish. Typically including boiled eggs, daikon, konjac, and processed fishcakes stewed in a light, soy-flavoured dashi broth. Although we already had a table booked in another restaurant for lunch a little later, we couldn’t resist the opportunity to sample one of their signature dishes. Individual elements of the dish are priced seperately, making it customisable to suit your tastes (just choose the ingredients you want included in the dish) and, at just ¥120 each, very affordable too. It came served with a decent sized smudge of equally warming Japanese mustard. Like many such places, the green tea is both free and unlimited. 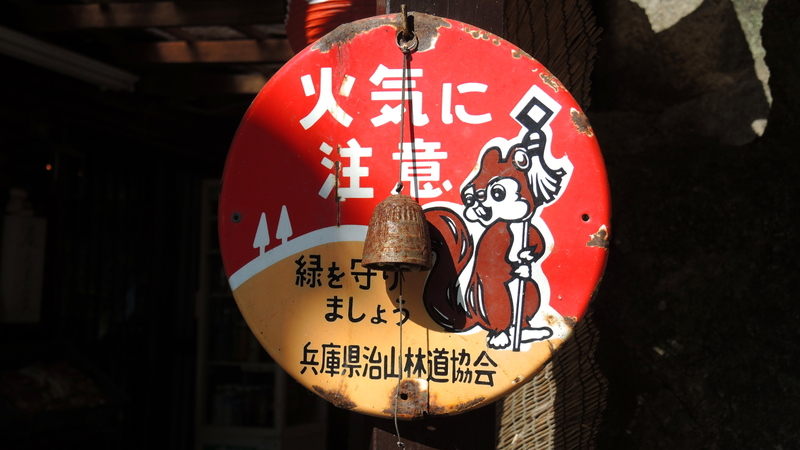 We didn’t know about Takinochaya when we headed out this morning. 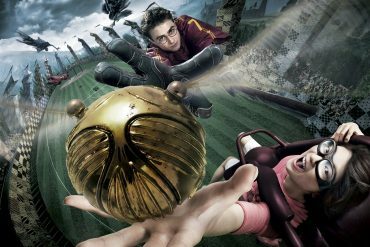 And yet it became one of the highlights of our day. The place has so much character I had to film it for prosterity (see video below). 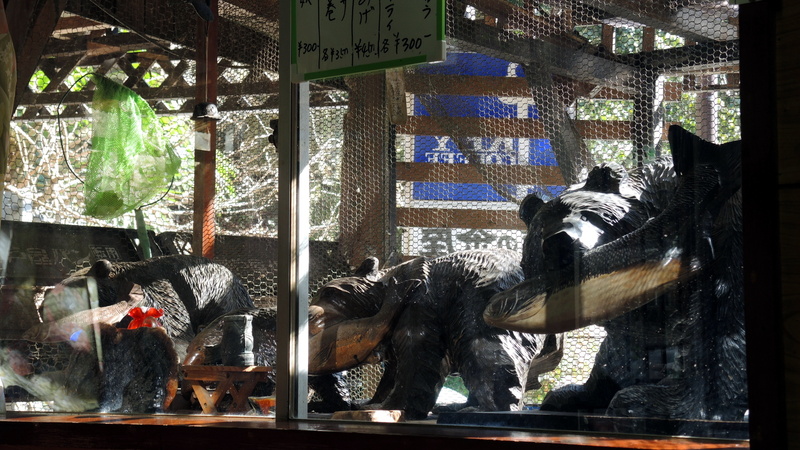 I hope you enjoy this rare peek inside Takinochaya – the restaurant hidden in the wild boar mountain. 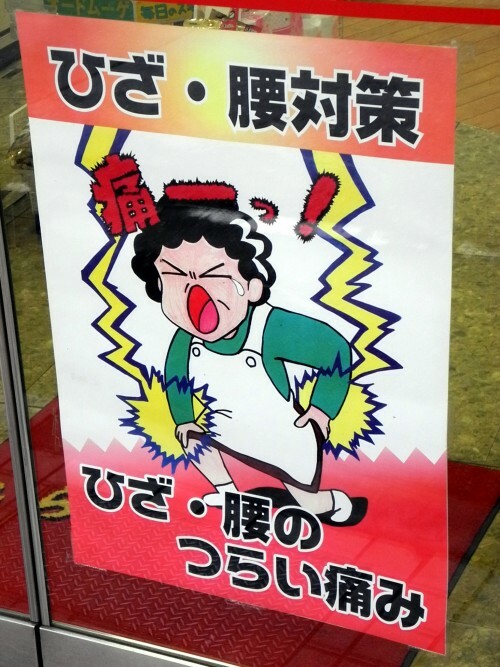 It’s a fine example of The Real Japan. And be sure to hit the bell icon to get notifications of all new posts!